My garage is a heavily armed military base for repelling an attacking enemy-droid army. 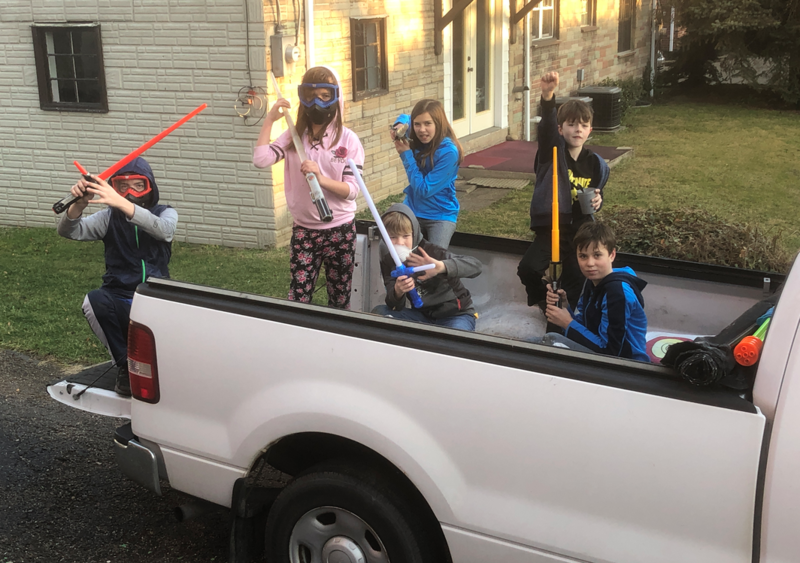 My parked pickup truck is a troop transport on some days, on others it’s an inter-galactic spaceship. My entire yard, in fact, is a battleground for Nerf-gun-armed zombie killers and light-saber wielding Jedi. Such is life when your property is the de facto neighborhood hangout. My kids are lucky to have a great group of kids living close by, all of whom possess vivid imaginations and enjoy playing outside. Every once in a while, when the stars are all aligned (i.e., the weather’s nice and none of the kids have any scheduled sports or other activities), a pack of children of various age and gender converge on our home and join my offspring for a spirited game of “zombie killers,” Star Wars, or some other sort of make-believe adventure. Luckily we’ve stockpiled enough light-sabers and Nerf guns over the years to supply a small army. For hours on end these kids run around our yard, stomping on my perennials, trashing my garage, and playing in the bed of my Ford F-150 as if it were a jungle gym. And you know what? I love it. The way I see it, at least they’re not inside somewhere staring zombie-like into some electronic screen. They’re outside. They’re moving. And they’re actually using their imaginations. It’s wonderful. When I was a youngster, I also had a group of friends who would regularly meet up for some good old-fashioned outdoor fun. Our official gathering place was Mr. Frank’s house. Mr. Frank must’ve been 150 years old or so, but he was really cool and he let us use his yard as our very own private playground. During the day we’d play football, soccer, frisbee, etc., in Mr. Frank’s spacious backyard. At night we’d chase each other around in the darkness playing release. We’d use his woodshed beneath the pines as a base for games or just as a shady spot to sit and talk on a hot summer’s day. We’d climb the chimney on the side of his house and sit on the roof (no joke) to catch some rays during the day or to admire the stars at night. Sometimes Mr. Frank would even let us borrow his machetes to go out in the nearby woods to do a little exploring in the “jungle.” Times sure were different back then. I have so many fond memories of playing with my friends in Mr. Frank’s yard. It was our special place—a place that still ties us all together today, despite going our separate ways in life. And even though he’s long gone now, I’ll always remember Mr. Frank for his kindness and generosity. Wouldn’t it be nice if one day the kids in our neighborhood looked back on our yard with such fondness? And when they do, hopefully they’ll remember me not as some grumpy old man who occasionally barked at them for leaving their empty candy wrappers and juice boxes in the yard, but rather the kind, generous, rather-young-looking-for-his-age fellow who allowed a bunch of crazy kids to cut well-trodden footpaths through his flower gardens and appropriate his garage for a Nerf gun arsenal.